I’ve recommended it to many people over the years, mostly elders who hadn’t considered the internet being that useful, and usually they’re like, “aw? A website? No thanks, it’s not necessary”. Which is fine even if internally I was like “plsssss no it’s so good”. A lot of gen-z are getting into fiber crafting and that is exciting. Up on the top right is your notebook, which you’ll probably visit the most because it contains all of the tools for organizing your projects. That’s your notebook, on the left bar are your various tools. Projects are lined up neatly on the rest of the screen. 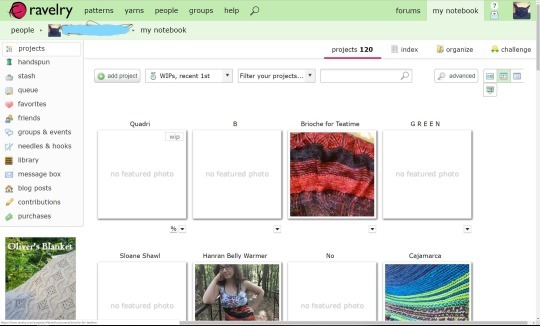 There’s a Handspun tab for spinners, Stash is where you organize your yarns, uQeue is where you list upcoming projects, Favorites is where you can save and organize your favorite projects/patterns, Needles & Hooks gives you a chart that you can fill in with what you already own, Library is a digital library of patterns and even representations of the physical books that you own. 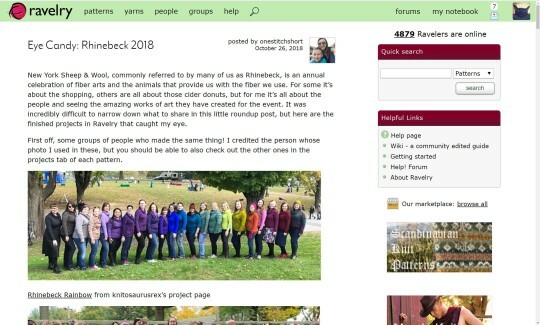 Each of these can be customized, for example in favorites in there is a place to bundle them, so that if you wanted to say make a bundle of everything you want to knit as Christmas presents throughout the year, you can do that. In Queue you can link the called for yarn and the yarn you are going to use, linked from stash or otherwise, you can make notes on each entry. I will often note whether I need needles and what kind, so that if I drop by the store, the info I need is just a couple of clicks away. There is even a place in the stash to note where you got your yarn and how much it cost. I’m not going much more deeper into that, but if ya’ll want me to do a post about specific tools let me know. 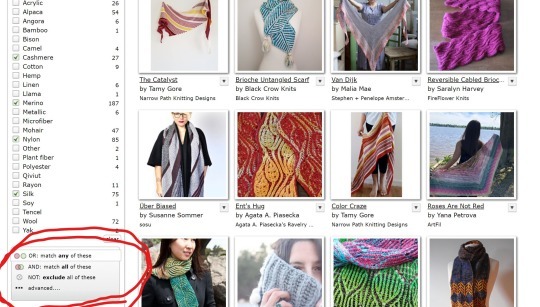 The most attractive part of Ravelry for me is easily searchable database of patterns. If you click on the Patterns button at the top left of the homepage, it takes you here. I typically go straight to pattern browser & advanced search through the link under the search bar. The great part of this are the filters on the left. 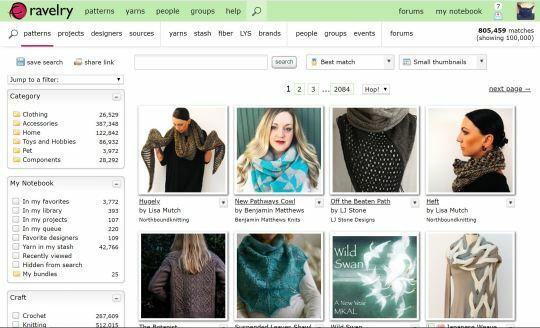 You can filter by category of clothing, if and how it’s in your notebook, by craft type, by it’s availability (like whether it’s free, downloadable, or purchased elsewhere), whether or not it has photos (because there are many self-published designers), by attributes such as shape, techniques, texture, and types of colorwork, by age, size, ease, fit, and gender, by weight of the yarn called for, by yardage required, by number of colors used, by pattern source, by needle size, by star rating, by difficulty, by origin of crochet terminology, and by language. There are many more search options after the main filters. So for example if I had exactly 700 yards of worsted eight yarn in two colors, and I knew I wanted to make a scarf, using bobbles and colorwork, I could search that. specify that I want merino, and cashmere, or silk, but not nylon. I still got 27 matches from that search, but that’s how big the database is. 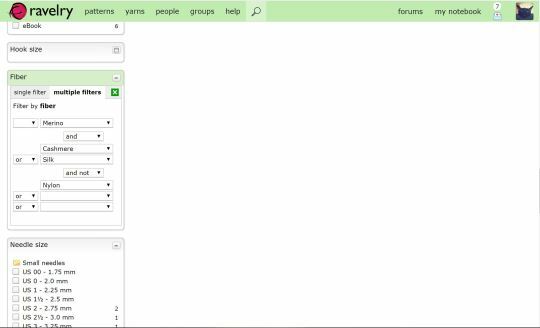 And the same goes for the yarn tab at the top left of the homepage next to patterns. 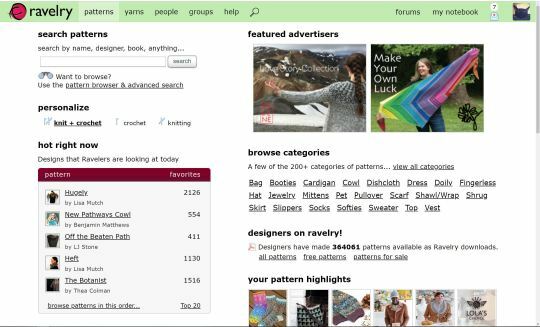 You can search through pretty much every yarn available, from red heart to indie fiber artists, using similar characteristics to narrow it down. I hope someone found this useful and if you’re a knitter or crocheter, it’s seriously worth a look. I’m not very active lately, but It’s where I go for inspiration if nothing else.